If you live in Mississippi and were hoping that if you ended up pregnant when you didn't want to be you could do something about it, better pencil your last minute abortion in now — the Senate has just passed a bill designed to target the state's last remaining abortion clinic. House Bill 1390 will require every doctor that provides abortions to be a board-certified OB-GYN with admissions privileges to local hospitals, and it was designed specifically to bully the one remaining abortion clinic in Mississippi. Phil Bryant is the state's newly-elected Republican governor who served as the co-chair of a committee that sought to push for passage of Initiative 26, Mississippi's "Personhood" bill that would have defined a "person" as any human tissue beginning from the moment of conception. Needless to say, he's totally 100% all about the new law, telling the Associated Press, "It's critically important, I think, to make sure we've got a certified physician there for that very complicated procedure, and if a complication does occur, that they have admission privileges or rights to a local hospital." When asked whether restricting abortions to the point that it was de facto illegal in the state would just lead to more dangerous abortions, Senator Dean Kirby, the Senate Public Health Committee Chairman responded, "That's what we're trying to stop here, the coat-hanger abortions. The purpose of this bill is to stop back-room abortions." Making abortions illegal will make abortions safer like making alcohol illegal put bootleggers right out of business. And by that, I mean that it doesn't take a brilliant economist to understand that enacting regulations specifically designed to make abortion inaccessible to women of Mississippi will actually lead to less safe procedures and more desperation. It must be opposite day in the Mississippi state government. The state's one remaining abortion clinic, the Jackson Women's Health Organization, currently employs three doctors, all of whom are board certified OB-GYNs. Additionally, the clinic has a transfer agreement with a local hospital in case of complications, and thus HB 1390 and Bryant and Kirby's feigned concern initially appears to be a solution in search of a problem. The board certification requirement isn't what could cripple the clinic, anyway. I spoke with Diane Derzbis, the owner of Mississippi's only abortion clinic, and she explained to me that the "admissions privileges" requirement is where her doctors will experience a snag. One of her staff physicians lives in-state, and the other two commute in from out of state. Local hospitals typically only offer admissions privileges to in-state doctors who will provide the hospital with 8-10 admitted patients per month. "We do not have enough problems to admit that many patients," Derzbis explained. Currently, there are three hospitals in Jackson that could give Derzbis's staff the privileges they need to keep the clinic in full operation, according to the Jackson Free Press— a Baptist-run hospital that has been noncommittal about whether or not they'd grant an out-of-state JWHO doctor admitting privileges, the University of Mississippi medical center, which only grants admission privileges to faculty members, and a Catholic-run hospital that, for reasons that should be pretty obvious, will not be granting abortion doctors the certification they need to continue to practice. The Jackson Women's Health Organization was founded and run by Susan Hill, a close friend of Derzbis who died of breast cancer two years ago. After her death, Derzbis and her partners bought the clinic and continued to operate it in arguably one of the most hostile environments in the country. If it closed, women in Mississippi who need abortions will have to travel to a neighboring state, and every state that touches Mississippi has 24-hour waiting periods in place for women seeking abortions. Women who can't spare the time to travel for hours and then wait 24 more will just have to tough it out and carry their unplanned pregnancies to term or resort to one of those "backroom abortions" Senator Kirby is so interested in preventing. The doctors who work at Derzbis's clinic put themselves at risk in order to provide the women they serve with a legal health procedure. 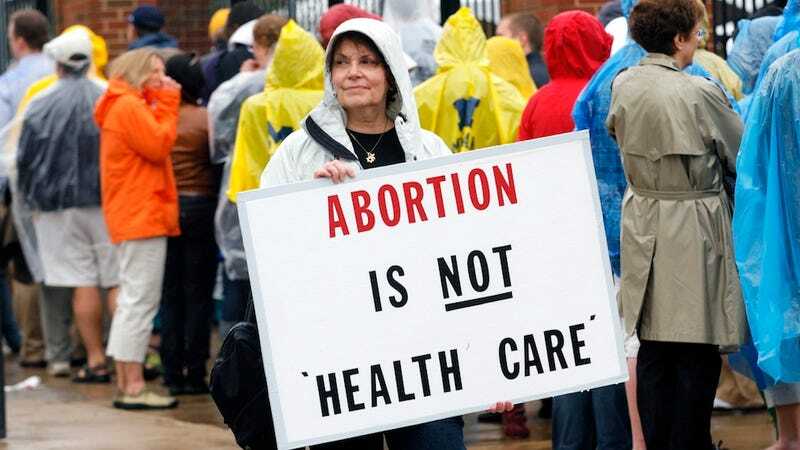 They've been stalked, followed home from work, had their cars and houses photographed, one had a poster with his face and the word ABORTIONIST posted around his neighborhood. Another was drinking coffee at a restaurant when a protester barged in and screamed at him until he was escorted off the premises. The clinic's got its own breed of protester, too, but Derzbis explained that by the time patients seeking abortion services arrive at the clinic, they've already overcome so many obstacles that "they dont' really care about a bunch of white protesters calling them murderers." If the Jackson Women's Health Organization is forced to close, opening a new clinic in the state won't be easy, explained Planned Parenthood's Southeastern Regional Director of Public Policy Felicia Brown-Williams. Since the 1990's, Mississippi has had a law on the books requiring that any new abortion clinic meet the standards of an ambulatory surgical facility and countless other insurmountable and unnecessary hoops. Once the law is passed, once it goes into effect on July 1st, the future of the JWHO is uncertain. "We're not going down without a fight," says Derzbis. So, to summarize: Mississippi just passed and is almost certain to enact a law that was passed to target one specific clinic, the only clinic in the state to provide a procedure that only women need. Lawmakers' concern was clearly not women's safety, as all of the doctors performing abortions are board certified OB-GYNs. As always, the so-called pro-life movement isn't protecting women from anything but the freedom to determine their own biological destiny. Having a uterus in the state of Mississippi is about to get much more harrowing.